Arsenal forward Danny Welbeck scored his first goal of the season this afternoon, as the England international’s strike firmly wrapped up all three points for the north London side. 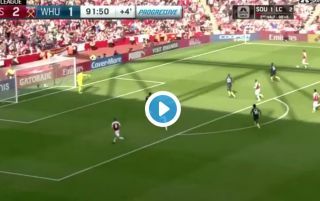 Arsenal had taken the lead thanks to an own goal from Issa Diop in the 70th minute, with Welbeck’s goal securing a first win at the club for new manager Unai Emery. Arsenal fans will be delighted to see this, as manager Emery will now have a bit of weight off his shoulders as his side pick up their first points of the new season. Here’s a clip of Welbeck’s goal. Insane composure from the forward!